Welcome to Part 3 of our series on games that will be celebrating a certain anniversary during this calendar year of 2017. With going back to 1997, we will be looking at games turning 20 this year. Just a heads up – this is a media heavy post so it may take some time to load depending on your connection; also there is a problem with many games showing a copyright of 1996 or 1998 while other info says the actual release was ’97. This happened due to released at the end or beginning of the year in different territories or just bad information on certain arcade tracking sites. Another list, another Arkanoid. 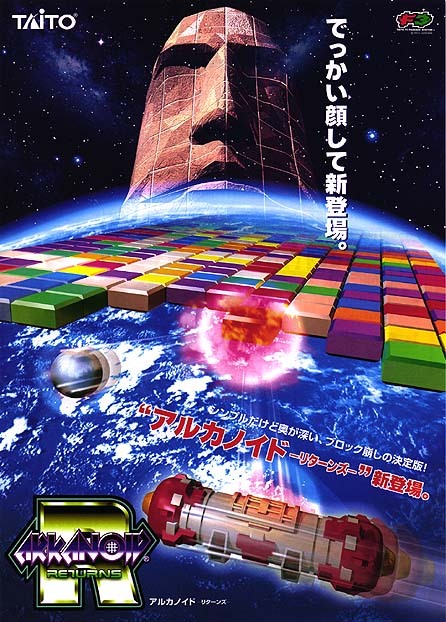 To this point in our present time, Arkanoid Returns marks the last time the series got any love in the arcade. As before, the objective of the game is to break the bricks using your ball and paddle. There isn’t a lot that is different from the previous entries in the franchise other than improved graphics and sound and some other tweaks to power-ups and the like. Via a setting, you could operate the game with a joystick instead of a paddle. Vertically scrolling shooters did enjoy greater success earlier on in the 90s but that didn’t stop games from advancing ahead, carving out their niche with more features, details and game mechanics. Such was the case with the sequel to DonPachi, the arguably more popular Do DonPachi. Known as a bullet hell or maniac shooter, the screen gets packed with enemies and bullets flying both ways; players are rewarded for not getting hit. It has been shown to be possible to 1cc the game without losing a life but that takes some real skill to pull off. With deeper mechanics in how the weapon system works and the combos, this is a highly regarded shooter to this day. 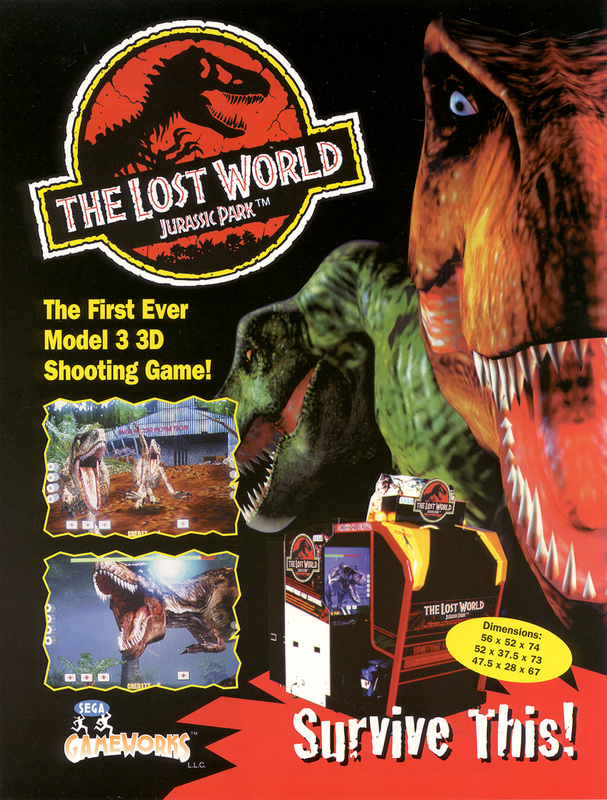 The late 90s saw not just the wider transition to 3D graphics but also in the attempt to distinguish arcades from home consoles, a move towards simulator style pieces. 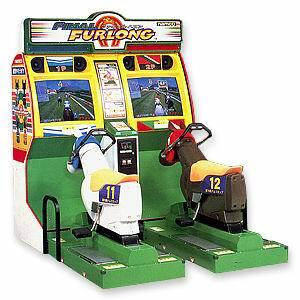 With Final Furlong, you found yourself in the role of a jockey, riding on a horse shaped seat that featured “realistic galloping motion”. With a rein and a whip to control the horse, this really captured the spirit of a horse race for what the tech could manage at the time. 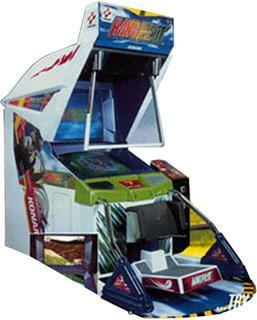 Cabinets shipped in the “twin” configuration and you could link two twin units together for a 4 player race. 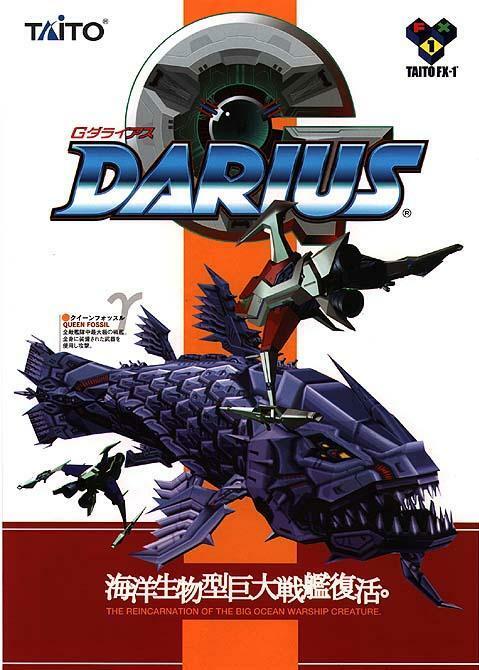 Taito’s iconic shoot ’em up series went 3D this time around, expanding on a few elements from Darius Gaiden (1994) while sticking with the less costly single screen format that DG also went with. One of those expansions was the use of the Capture Ball element, allowing you to capture and enemy then use them as a weapon. This also could be used to create a destructive beam, something that the sequel to this, Dariusburst Another Chronicle, would embrace as the crowd thinning Burst Laser. Another simulation game entry, this one was rather ambitious in that it recreated hang-gliding. I remember coming across this at a local arcade but I rarely saw it working. The cabinet easily stands out for this one – you have a swivel foot base that could be found in a skiing game but also a knee-rest then the hang-bar. To help simulate the feeling of looking down, they put two monitors into this – one directly in front of you and the other angled below. This was certainly one game that just doesn’t translate correctly when it comes to home hardware. Like many of the games on this list, Sega’s first Harley Davidson game was part of the game selection at the first arcade I worked for. Also like many of these titles, it was pushing for that arcade-only simulator kind of experience thanks to the bike controller. 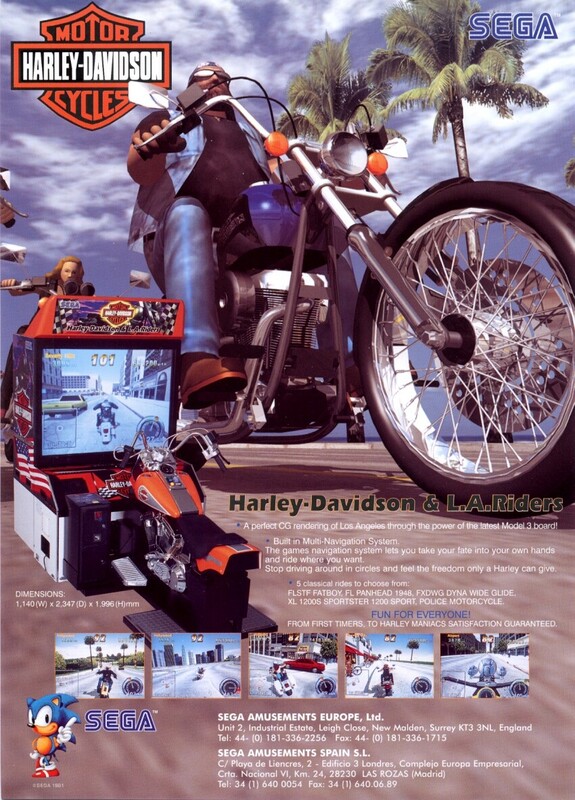 The game itself has you racing around Los Angeles on one of five licensed Harley-Davidson bikes. With many paths, side streets and shortcuts to take, it feels a little more “open-world” than your typical racing game. You could also link up 4 units together although for whatever reason I only ever came across a single unit, usually a deluxe model. 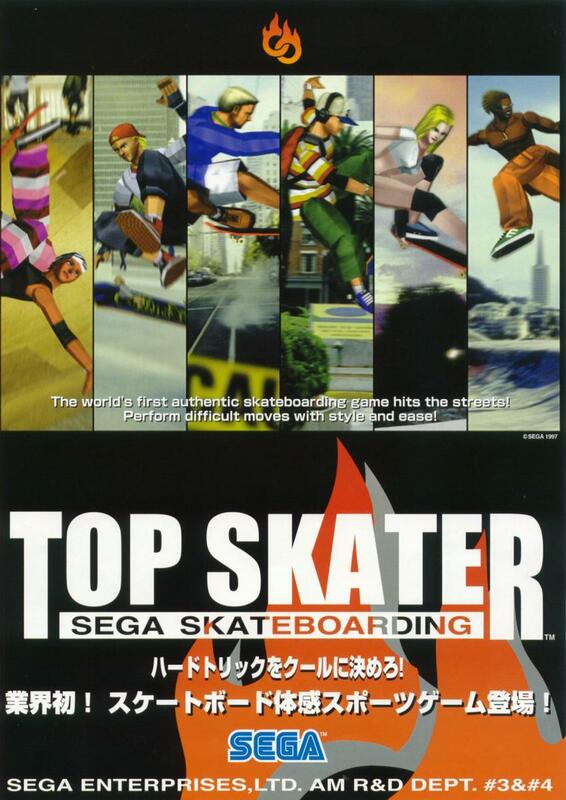 Sega did a sequel of sorts to this in 2009 called King of the Road but it wasn’t on the market for too long. 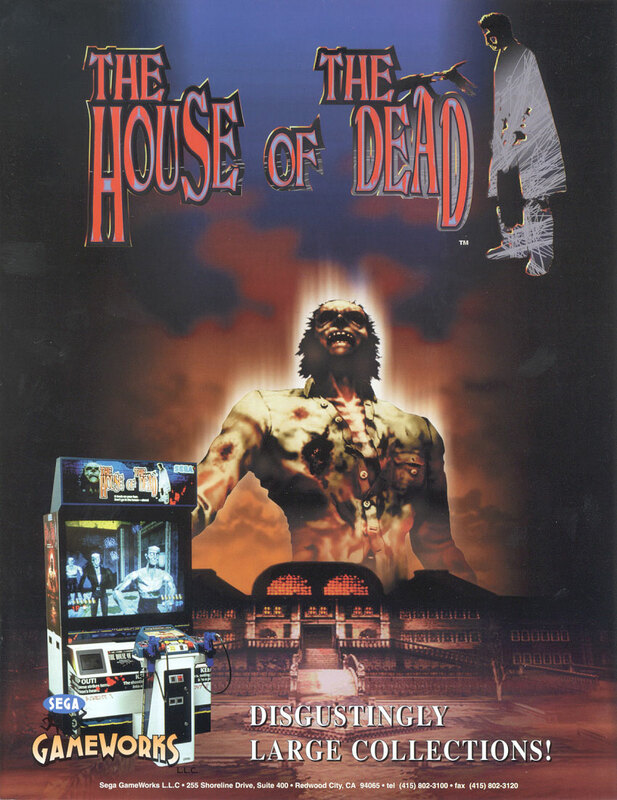 Zombie games have been around for ages now but one that set a standard for others to follow was Sega’s The House Of The Dead. I still see readers hoping for a HOTD5 all the time – I guess we’ll know by IAAPA 2017 whether or not Sega will use the 20th anniversary for that occasion. Copyright does say 1996 but the Japanese flyer lists the release as 3/1997. 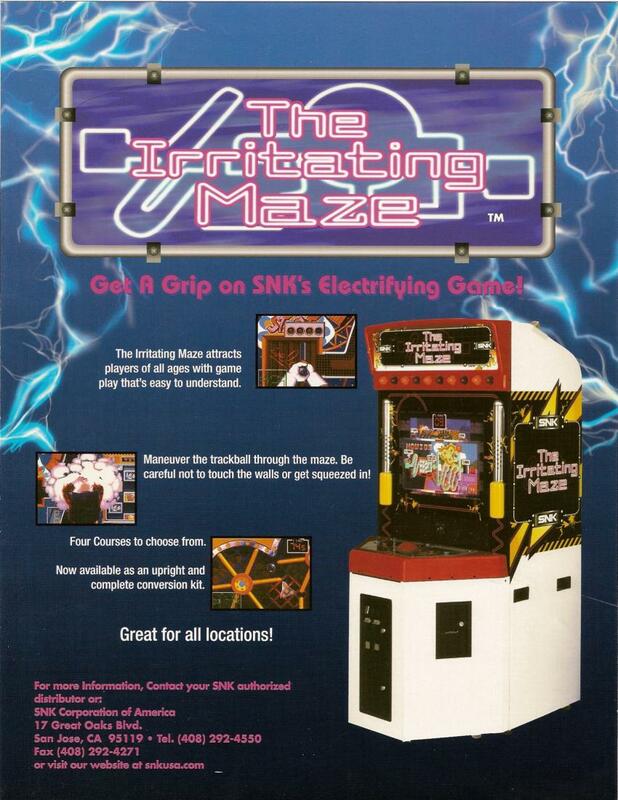 Some of the most popular arcade games in history have involved mazes in one form or another. For one to be billed as ‘irritating’ though, that was a bold move on SNK’s part. It’s like using the word ‘boring’ in your movie title. The goal of this game is to move your rod through the maze using a trackball (SNK’s first game to use one). You must reach the goal before the timer runs out. That would be easy enough – if the maze wasn’t made ‘irritating’ with jagged, narrow passages, various obstacles and an blast of air that would punish the player if they made a mistake. This stands out among the NeoGeo MVS library for those reasons above but also by being offered in a dedicated cabinet. I like to call KOF “Japan’s Golden Tee” since it happens to be their arcade game series that has enjoyed many annual outings. That run isn’t as consistent as it used to be but it is a challenge to keep such a story heavy series fresh from year-to-year. KOF’97 continued the elaborate multi-character storyline established by the game’s predecessors, offering backstory to each of the 29 characters and multiple endings to satisfy KOF fans. The main story dealt with mythology and Orochi’s infected blood while the gameplay continued to focus on 3v3 team battles. Fighters weren’t the only pop-culture genre that caught fire in the 90s. Dinosaurs were a hot item between cartoons (Land Before Time, Denver The Last Dinosaur, etc.) and the translation of Jurassic Park from book to the silver screen. With the sequel hitting theaters, Sega jumped on the chance to produce another JP game based on that sequel. As the first shooting game to grace Sega’s new Model 3 hardware, this game was a bit more complex and certainly more detailed that its predecessor. This is also back when single-shot/pistol games were popular so no spraying ‘n praying like we see now. It was a game that created some precedents – the “team work” screen at the end of a level and putting a shooting game inside of a cockpit/environmental cabinet. This game is still reportedly a solid earner from what I have heard. Shooting dinosaurs just never gets old. Mortal Kombat used to be known as an arcade series since it finds its roots there. 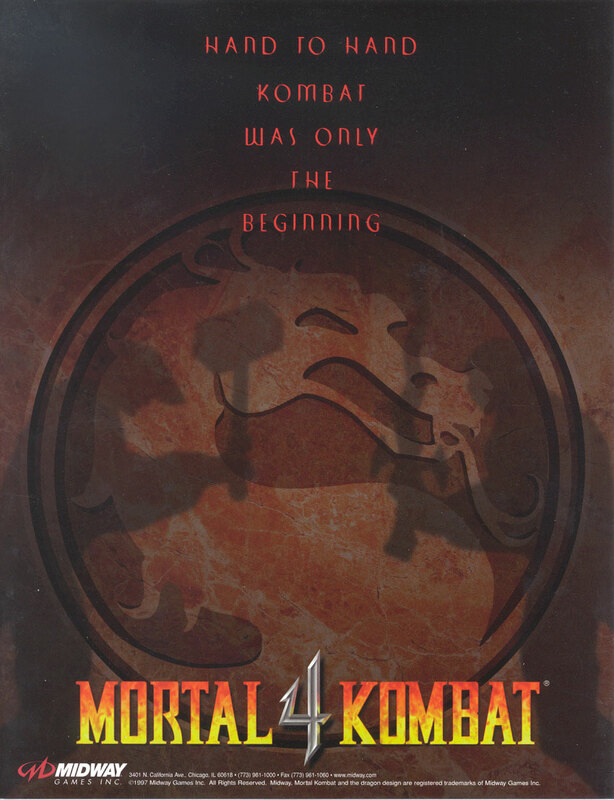 It has been twenty years since we’ve seen an official MK release in arcades, with Mortal Kombat 4 marking the last time that it graced commercial game floors. MK4 did not generate quite as much excitement as its predecessors however. It did mark the first time that the game would go 3D and at the time I remember it being impressive (remember when we used to talk about “polygons per second”? That was what replaced the talk about “bits”). On top of the 3D, MK4 introduced a weapons game mechanic where one could unsheathe their weapon and use it – or lose it. We had this at the first arcade I worked at as well but it was consistently in the bottom five earning games. Having enjoyed great success off of their NBA licensed games (NBA Jam, Maximum Hangtime), it was a natural fit for Midway to do the same thing with football. Blitz was that answer, bringing the sport into 3D arcade glory. The premise is straightforward – play a game of accelerated football (to satisfy the needs of the fast moving arcade) and let players pick then-current NFL teams as well as plays. Part of those plays allowed for joystick combos that would let the savvy users pull off trick plays. Blitz boards were versatile, allowing for 2 or 4 player configurations as well as different kinds of joysticks (standard 8-way or analog sticks). 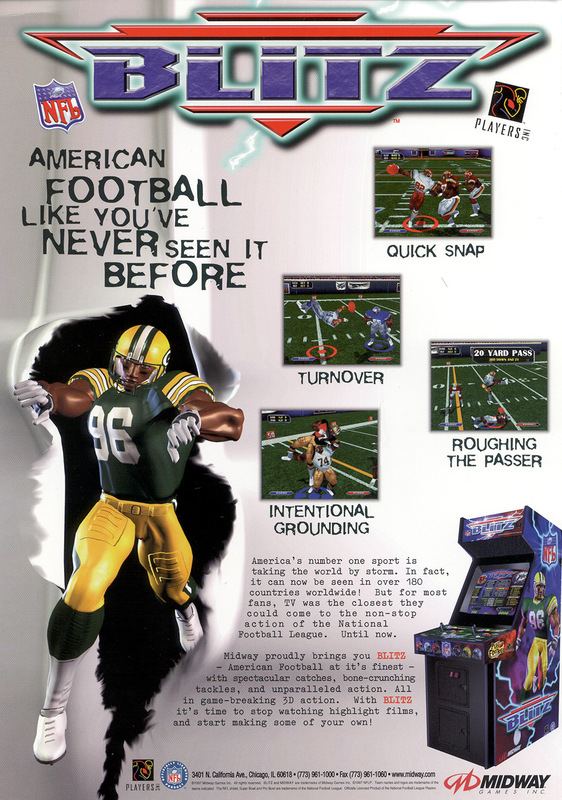 After the Blitz series and Midway ended however, we’ve seen very few sports games grace the arcade in the West; Madden by GlobalVR being the last time football in particular was given coin-op treatment. When I started my first arcade job, the game that existing employees had just finished being very competitive over was this. I hadn’t heard of the game previously but after a play or two, I quickly figured out why it was so loved. 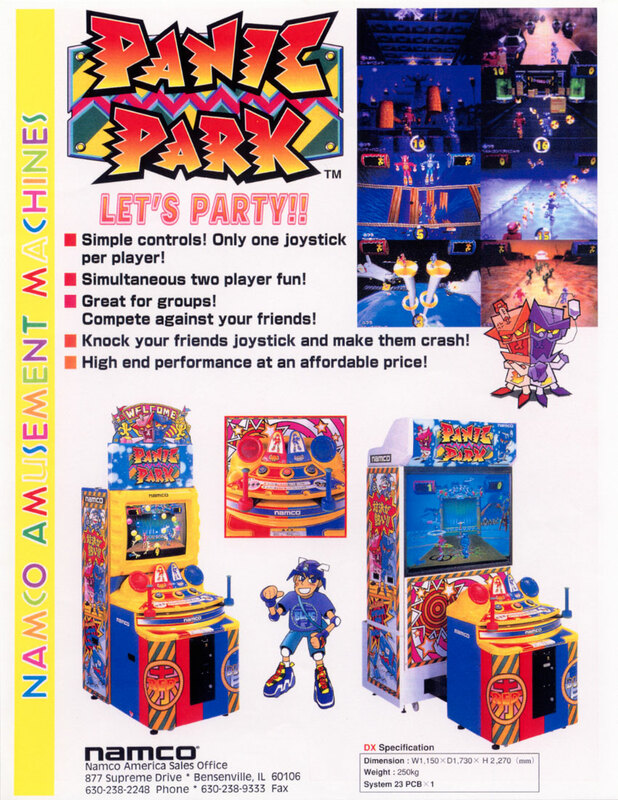 Panic Park is a mini-game collection, the stuff that goes over great at parties like the Mario Party games. Two players compete in various events using clever sliding joysticks – you push against each other which creates for plenty of fun scenarios against a friend. You can play solo too but the charm and the enjoyment is always against someone else. It is unfortunate that we don’t really see more games like this anymore as the arcade space the perfect place for it. 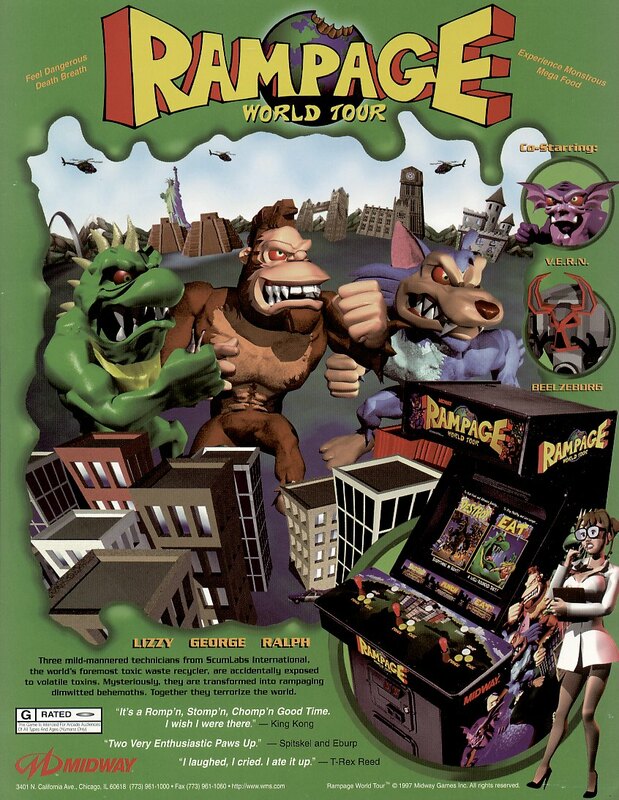 Rampage was one of those games that seemed to reach classic status pretty much as soon as it was released. The original was ported to just about everything and for good reason. It was 1950s Monster Movie the Video Game and great multiplayer fun. So in 1997 Midway resurrected the concept with World Tour. The graphics used the odd pre-rendered sprites look that was popular for a short time while the game itself simply built on what made the first one a success – three player co-op, rampaging through cities, destroying and eating just about everything that would get in your way. This would offer more variety across the 130 levels along with some other enhancements that made it stand out in any arcade. This was another game found at the first arcade where I worked. It was cool to look at but our technician had a heck of a time keeping it operating. When it worked though, it was quite the popular game. 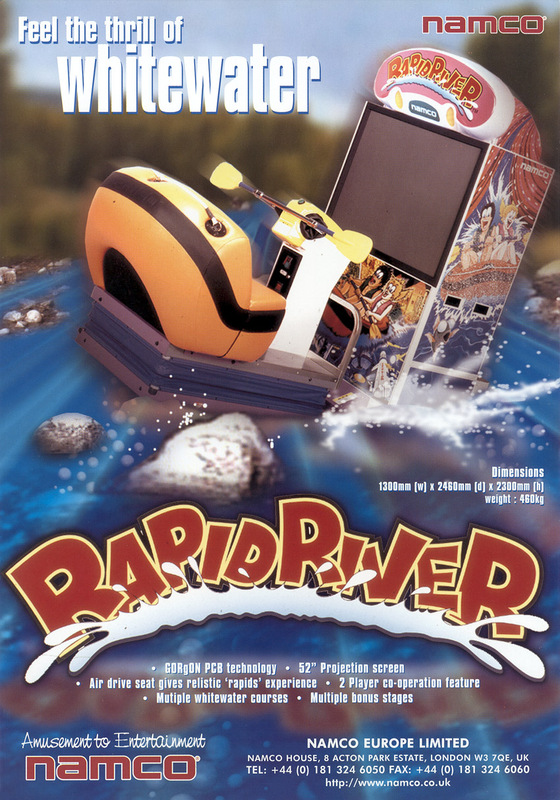 As a simulator game, it sought to give the player the whitewater rafting experience without having to get wet. The raft-like seat had a pneumatic force feedback system and the controller was quite unique, representing a realistic boating oars that one or two players could use to navigate the river. 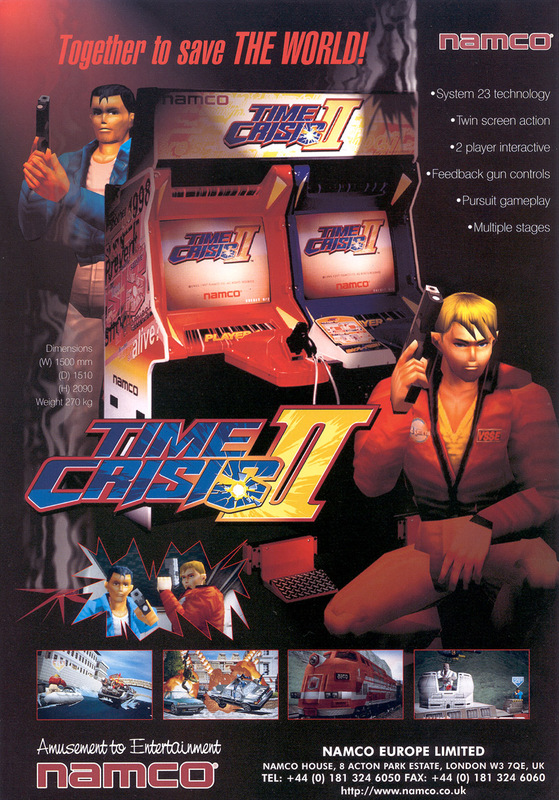 This sequel came about rather quickly, the first game having been released the December prior. As the Rush series is turning 20 and other 90s racer games get remakes/sequels, a lot of people are itching for Rush to make a comeback. 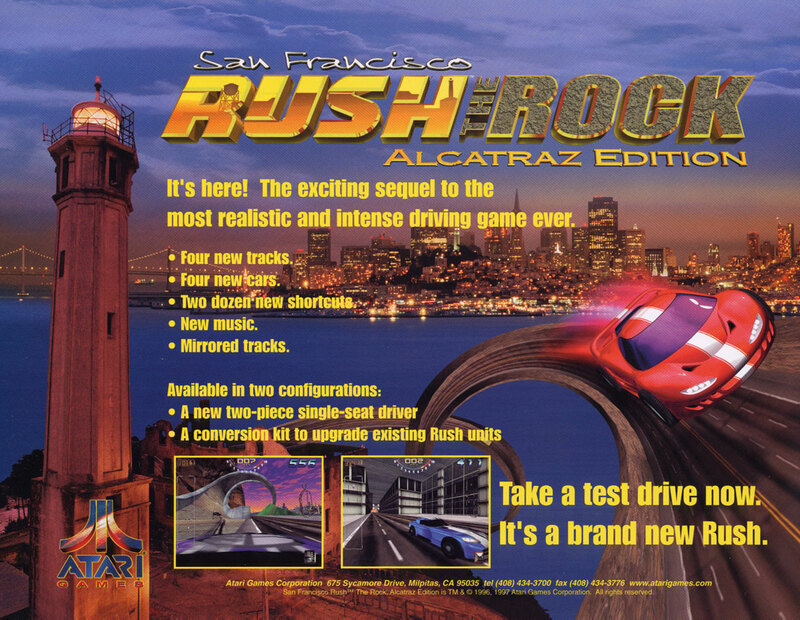 The Rush series prided itself on providing realistic driving physics along courses based upon the famous city of San Francisco. This also cleverly tapped into the popularity of a movie by the name of The Rock, without having to get a license. Rush The Rock added more cars, more tracks(including mirrored), more shortcuts and more fun. The late 90s saw the last gasps of certain genres, the overhead run’n gun being one of them. This was because the push for so many games was to go 3D and this particular style of game was something better handled with the finer details that 2D could provide. 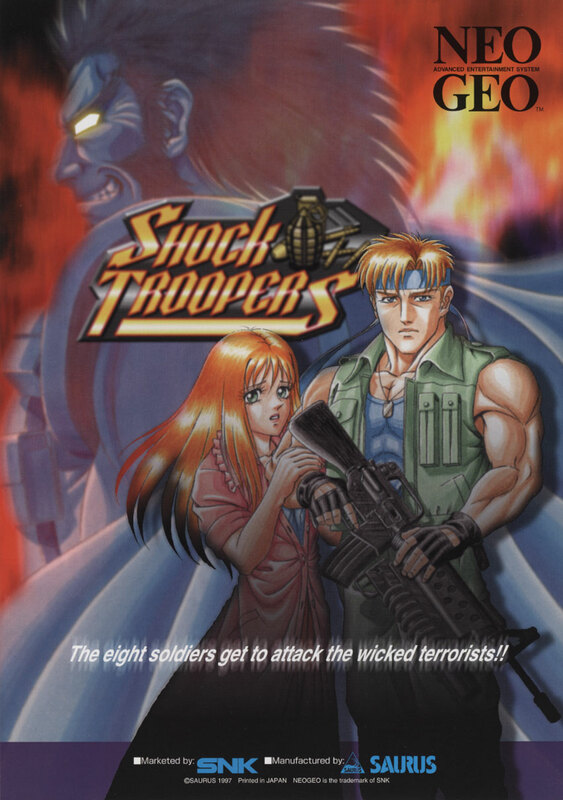 I like to think of Shock Troopers as Front Line/Commando/Ikari Warriors having offspring with Metal Slug. It has all of the well-paced macho action you could want for 1-2 players along with superb sound. I remember the idea of Street Fighter II never reaching the third installment being a joke at one point in the 90s. By 1997, Capcom finally relented on upgrading SF2 and gave us the more technical SF3. Street Fighter III might not prove quite as popular as its predecessor but it still carved out a loyal fanbase, especially with the 3rd upgrade, Third Strike that came along in 1999. 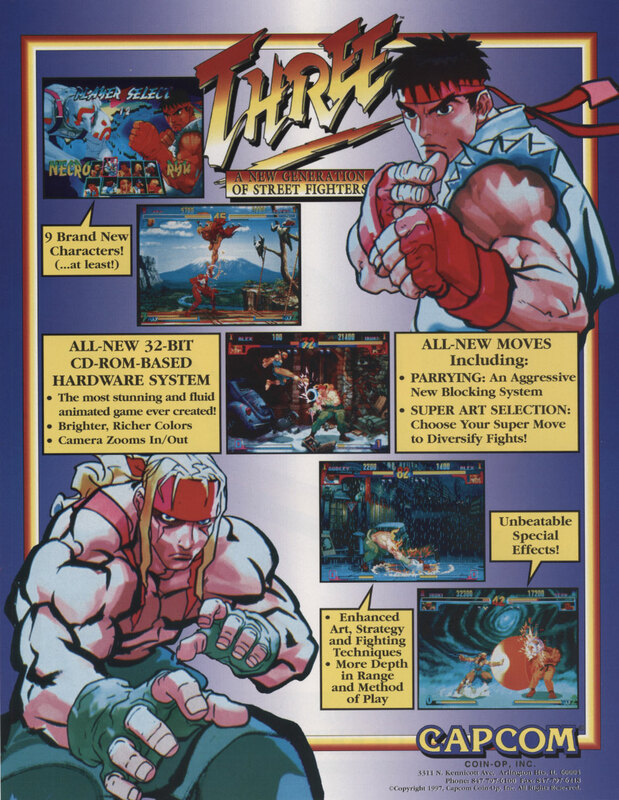 With the first edition in 1997, Capcom started off with a mostly new character roster (excepting Ryu & Ken), added some elements from games like Darkstalkers while introducing Super Arts and Parrying. I think it is a fine looking game, taking advantage of the extra power from the CPSIII hardware to make the levels more interesting. Sometimes a sequel surpasses the original in such a way that no one really remembers that original. I think this was the case with Time Crisis II as I never hear anyone asking for the first one. This kept the same foot pedal mechanic of reloading/taking cover but added a second screen, giving each player their own perspective in the game. This gave the game additional replay value on top of the action-packed levels. This screen-per-person idea would be used in every Time Crisis since. This was another game that was a popular piece to find at the FEC I first worked at. It spawned some sequels although I’ve rarely come across those. Densha De Go!/ Let’s Go By Train! (Taito) – Live out your Japanese train engineer dreams with this one. It isn’t well-known in the West but has spawned various sequels including one just shown off at JAEPO 2017. Golden Tee ’97 (Incredible Technologies) – at this point in history, Golden Tee wasn’t known for it’s annual outings, which started with GT’97. The Last Blade (SNK) – High quality 2D fighter that featured a great battle system and equally compelling graphics. Magical Drop III (Data East / SNK) – The Magical Drop series was an excellent puzzle game series, with the 3rd iteration featuring more of everything. This was apparently Data East’s last game. Maximum Force (Atari Games) – Atari hit pay dirt with Area 51, which was the best selling game for the company of the 90s when it was released. Maximum Force used the same digitized actor engine but now with a focus on terrorists instead of aliens. Samurai Showdown 64 (SNK) – SNK attempted to hop onto the 64-bit bandwagon as a way to replace the MVS but that didn’t work out despite Samurai Showdown coming into 3D. Strikers 1945 II (Psikyo) – An excellent follow-up on the Strikers revival of the 194x series. Surf Planet (Gaelco/Atari Games) – I always forget that this is actually a snowboarding game instead of a surfing game. Designed as a kit, it didn’t feature a snowboard controller, just a joystick. Vampire Savior (Capcom) – Another 2D fighter from Capcom that kept pushing the CPS2 with before they moved on to more powerful hardware. That isn’t everything released in ’97 but should cover a nice range. What was your favorite game from that year?